In theory, this kind of post is what Omnyom.com is for, but in a content drought, spreading around what I _do_ write is probably unwise. So, a food thing. I like iced-coffee during the summer. Generally I’ve got a bottle of cold-brew in the fridge, and that plus milk and a bit of sugar syrup (generally on hand due to a cocktail habit) makes a nice iced coffee. I’m also generally interested in other food types. I’m not vegan, or vegetarian, or even allergic to anything, but I think that that’s no good reason to ignore “vegan alternatives” in a more omnivorous diet for their own properties and tastes. So since I quite like almonds, I bought almond milk and attempted to use it as a milk alternative, to mixed results. The store-bought stuff wasn’t “right” in tea (It’s going to take more than a few days to retrain thirty-odd years of tea with skimmed milk, though I trained myself out of sugar in tea to the point where tea and sugar just tastes wrong, so it’s all possible). It was fine with cereal, if a little thin, but worked great in iced-coffee. 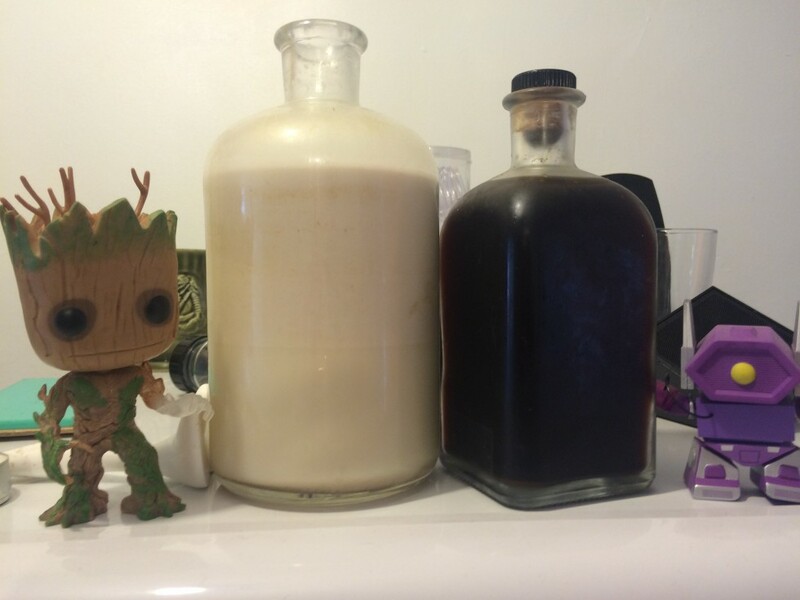 Almond milk & cold brew coffee. Groot for scale. With a half bag of decaff ground coffee slowly drifting towards its use-by date, I decided to make a batch of cold-brew with it. Using a tip I’d seen online, I bought a nut milk bag for it (it’s quicker and easier than the muslin filters I was using before), which is basically a draw string nylon bag. Cold Brew Coffee: Twice as much cold water as coffee. In a jug. In the fridge. For a day. Strain, bottle, fridge, drink within a week or so, maybe two. If it’s going to go beyond that, fill an ice-tray with it (ideally plastic rather than silicon) and freeze. Almond Milk:You soak some almonds in water for some hours, attack them with a blender and more water, and aggressively filter the mush until it’s mostly dry and you have a small lake of almond milk, which you then bottle and fridge. Lasts a few days.